We all know it’s difficult to get customers into your physical store these days. Thanks (or no thanks!) to the ease and convenience associated with online shopping, brick and mortar-only merchants have to work increasingly hard just to maintain steady foot traffic in their shops. But once you attract that traffic (be it through a compelling storefront, a killer omnichannel marketing strategy, or effective word-of-mouth), you should focus on crafting a personalized experience so unbeatable that those customers come back again and again. Here, we discuss four tips to turn your brick and mortar spot (or spots) into a personalized wonderland. Let’s get to it! Cultivate a killer team — and give them the tools they need to create memorable experiences. All the tips we discuss in this post are actionable and practical, but this first one’s the most important. The employees you hire will make or break an in-store personalization experience. We’ve written before on how to find and recruit superstar employees — but once you have them, it’s essential that you empower them to give your customers incredible experiences by providing them with the right tools, knowledge, and skill set. So how do you do that? By putting them through the proper training. With the right training, each member of your team will be able to walk that critical line between being helpful and overbearing, and they’ll know how to use your business’s customer data and analytics to provide each shopper with a memorable and personalized experience. Your training program should be tailored to the needs of your unique business; if you don’t already have one in place, either develop your own or adapt it from that of an existing company you admire. Probe politely to understand all the customer’s needs. Armed with a specific blueprint for each customer interaction (and, of course, in-depth knowledge of Apple products and tech), Apple store employees can focus on satisfying each shopper’s specific needs and making sure everyone leaves happy. Use this as a jumping-off point for your own in-store training plan! Location technology such as beacons has become an increasingly important tool in the quest for in-store personalization. If you don’t already use location technology in your physical shops, it’s time to consider implementing it. First, let’s talk about how this tech works. Via Bluetooth, beacons use your customers’ mobile devices to track when they enter your store and where they go once they do. This information allows you to target those customers with personalized notifications and to gain insights into their in-store behavior. From these insights, you can take personalization even further. Let’s say your beacons tell you a particular customer is spending lots of time in the section of your store reserved for athletic shoes. Using this information, the beacon can ping a customized discount for that product category (or even that specific product, depending on the layout of your store) straight to that shopper’s phone. Beacons and other similar devices provide you with personalization capabilities that’ll soon be ubiquitous across brick and mortar stores. To that end, we recommend finding ways to leverage location technology in out-of-the-box, creative ways. Instead of simply pushing sale or promotion notifications to customers’ phones or tracking their in-store paths to offer tailored communications, use this opportunity to cultivate and enhance your brand and to set yourself apart from the competition. Harness the power of mobile. 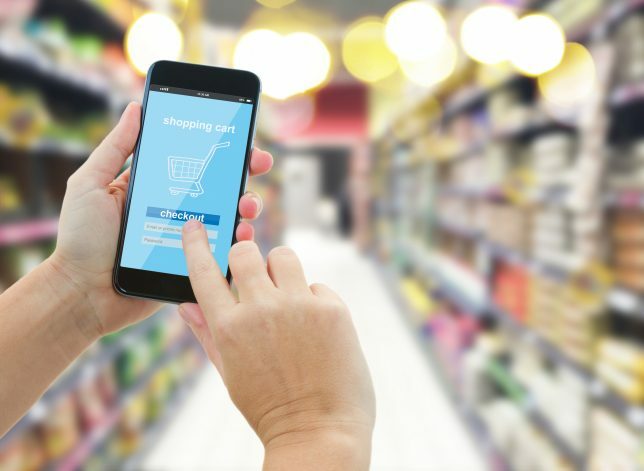 It might seem counter-intuitive — after all, it’s easy to assume that ecommerce and mcommerce (mobile commerce) are the nemeses of brick and mortar retail — but integrating the mobile and in-store experiences is essential to creating seamless customer journeys (for more on improving your business’s omnichannel strategy, head here). According to a recent study by Nielsen, 87 percent of smartphone and tablet users shop on their mobile devices. That’s a huge number, and brick and mortar retailers can capitalize on it to personalize the in-store experience. In addition to funneling location technology through mobile like we just discussed, you can use the fact that nearly every one of your customers has a mobile device connected to the internet to your distinct advantage. How? Integrate your mobile app with the in-store experience you’re attempting to create. When a customer enters the store, ping his phone with a notification to open your mobile app for a special discount. Encourage customers to keep your app open as they browse the store by allowing them to scan barcodes to learn more about products. When a customer does scan a barcode, offer a small discount on that product. Recommend other products based on customers’ scanning and browsing histories. For inspiration, let’s look to two retailers demonstrating creative in-store/mobile strategies. Walgreens, one of the biggest drugstore chains in North America, has integrated mobile into its in-store experience in an effort to make things easier for its customers. On the Walgreens app, you can refill a prescription, collect paperless coupons, and map out your actual visit by perusing store layouts. The idea behind all this? To incentivize customers to go to an actual Walgreens location and to give them a quick, painless experience once they’re there. Another retailer doing innovative things in the in-store/mobile space is Neiman Marcus. The retailer’s NM Service app allows customers to chat with their favorite sales associates whenever they need, select items to try on in-store at a later time, and enjoy a personalized “VIP experience” when they arrive. Showrooming is the act of using your mobile device to browse or shop online while also in a brick and mortar store. When customers do this, they’re essentially looking for better deals on the same or similar products. And thanks to the limitlessness of the internet, there’s nothing you can do to stop them. Offer price matching. This is an excellent way to ensure showrooming doesn’t steal any customers away from your store — so if your bottom line can handle it, implement price matching in your brick and mortar locations. Train your team to upsell. This goes back to the importance of hiring a great team (tip #1 in this post). A clever employee — one who knows how to connect with shoppers on a personal level — truly can make or break a sale. The interaction between a member of your team and an in-store customer can determine whether or not a customer will leave to purchase online after showrooming or instead reward a personalized experience with an in-store purchase. Put product reviews front-and-center. One of the things people are doing when they showroom is, of course, looking for cheaper prices — but they’re also looking for reviews on products themselves. If a customer is able to use your app to peruse (positive) customer reviews of a particular item, he’s more likely to walk out of the store with that item. Will you implement any of these tips in your brick and mortar stores(s)? Let us know in the comments! The post 4 Tips Brick and Mortar Retailers Can Use to Personalize the In-Store Experience appeared first on Vend Retail Blog.